A campaign is being launched to keep English composer Edward Elgar's image on the back of the £20 note - for the time being at least. MPs from Hereford and Worcester, Elgar's birthplace, have tabled a motion to Parliament asking to keep his face on the note for a little longer. Next year marks the 150th anniversary of his birth and the MPs want him to stay on the note until afterwards. Elgar is due to be replaced by Scottish economist Adam Smith in the spring. Elgar is famous for a string of symphonies and concertos, with Land of Hope and Glory, or Pomp and Circumstance, being among his best-known scores. The motion has been signed by Mid-Worcestershire MP Peter Luff, West Worcestershire MP Sir Michael Spicer, Leominster MP Bill Wiggin and Hereford MP Paul Keetch. It is also backed by Peter Ainsworth, MP for East Surrey and chairman of the Elgar Foundation. Mr Luff said: "We understand the design of bank notes has to change from time to time, but this is profoundly the wrong time to make this particular change. "Mr Ainsworth and I are trying to persuade people in the county to do much more to celebrate the 150th anniversary of Elgar's birth, and then we are undermined by this extraordinary decision of the Bank of England to take England's most famous composer off English bank notes in his anniversary year." He said Adam Smith was a fitting replacement, but he wanted the removal deferred to a later date. The decision to use Smith's likeness on the notes was made by the Bank's governor Mervyn King. Worcester MP Michael Foster has written to Mr King urging him not to delete the picture of Elgar and Worcester Cathedral until 2008. 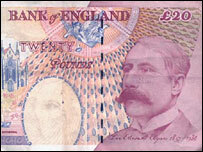 A spokeswoman for the Bank of England said the pictures of Adam Smith would be introduced in 2007 but the Elgar notes would remain in circulation. "There are over one billion notes in circulation so it would be impossible to get rid of them overnight. "A large number will remain throughout 2007. I hope that will be of some comfort," she said.